"It is completely unacceptable that you do this." Environment Minister Catherine McKenna answers questions after Canadian Council of Ministers of the Environment meeting in Vancouver on Friday. VANCOUVER — Environment Minister Catherine McKenna confronted a reporter for The Rebel on Friday, demanding he make a commitment that the far-right website stop calling her "climate Barbie." Rebel Media reporter Christopher Wilson got into an exchange with Environment Minister McKenna in Vancouver on Friday. Christopher Wilson identified himself as a Rebel reporter and asked McKenna a question about the federal government's opinion on the role of hydroelectricity as a clean power source. "So you're the Rebel Media that happens to call me 'climate Barbie.' I certainly hope that you will no longer use that hashtag," McKenna said. "Me personally, yes, but I don't have editorial control of others," Wilson responded. Wilson then accused McKenna of banning one of The Rebel's correspondents from going to an upcoming climate conference, which McKenna denied and said she wrote a letter encouraging the outlet to come so they could learn about climate change. "Absolutely, and I have a legitimate question about hydroelectricity's role," Wilson said. "The reason I'm asking you not to do this is because I have two daughters. There are lots of girls that want to get into politics and it is completely unacceptable that you do this," she said. Wilson replied by saying he finds it unacceptable that McKenna "smears" people who question climate change as "deniers" with "all the connotations of the Holocaust denial." The Rebel did not immediately respond to a request for comment, but on Saturday morning the outlet posted several tweets using the "#ClimateBarbie" hashtag. 4. Our Alberta bureau chief coined the phrase "Climate Barbie", a reference to McKenna's shallowness. She did not disprove that tonight. 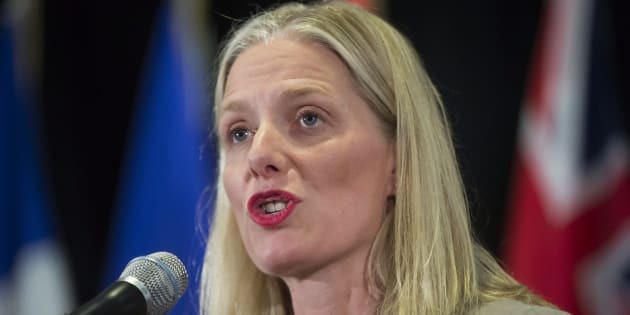 However, after his testy exchange with the minister Wilson wrote in a Twitter post, "Our Alberta bureau chief coined the phrase 'Climate Barbie,' a reference to McKenna's shallowness. She did not disprove that tonight." In September, Conservative MP Gerry Ritz apologized for calling McKenna "climate Barbie" on Twitter, saying the term is "not reflective of the role the minister plays."